RIM’s implosion seems monotonous at this point with its stock plunging and co-founders Jim Balsillie and Mike Laziridis giving up their co-CEO duties. Seing how the BlackBerry PlayBook bombed last year, along with a majority of its other outdated handsets, all efforts and hope have been passed onto the company’s new BlackBerry 10 devices due later this year. 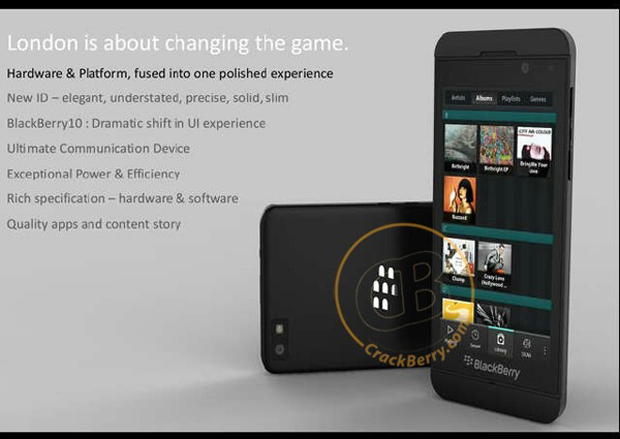 Rumors have circulated of RIM canceling its BB 10 lineup at the beginning of the year, but CrackBerry might have killed those reports after snagging this exclusive shot of what many analysts presume is the BlackBerry London. An image of the London hit the Net last November and featured a completely different design in comparison to the model above. The recent design takes a page from several recent Android offerings with its slimmer profile, dual-cameras, countered edges, and matte black finish. Kind of resembles the Playbook don’t you think? Though this is billed as a mockup, the London could undergo a third facelift before its official unveiling, which we’re expecting sometime this summer. On the specs side, some say that TI OMAP5 and Qualcomm chips (1.5GHz dual core processors) are being tested. Judging from the image, we’re guessing 4.3-inch display, LTE capability, 8MP camera, 16GB internal memory, 1GB of RAM, and a more attractive UI courtesy of the new BlackBerry 10 OS. Business features still remain a mystery, but we can expect a flurry of applications as RIM plans on supporting the Android Market for all future BB 10 phones. Other reports have BlackBerry’s next-gen models, the Laguna and Lisbon, set for the US market and hitting AT&T, Sprint, and Verizon stores late 2012. The London is slated for a UK release at the moment. Go fig. What up RIM? Can’t we get some BlackBerry royalty here? And yet they wonder wghy the company’s market share has plummeted.